On December 23,2013, longtime House of Blues monitor engineer Gary Druilhet experienced a stroke while running monitors for a multi-band show. He was taken to the hospital where he suffered another stroke. At the time, his health insurance was not yet in effect. 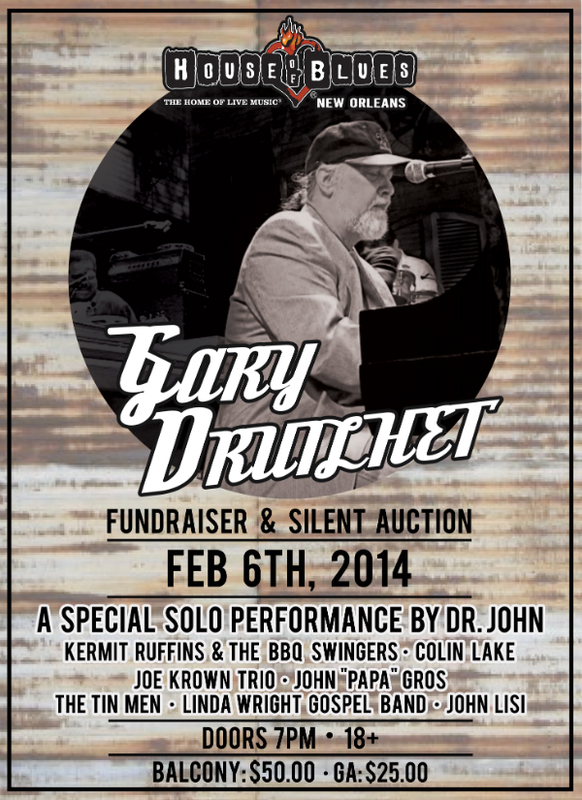 The benefit concert, scheduled for tonight, will raise funds to help cover his medical expenses. It features a rare solo performance by Dr. John. Dr. John, aka Mac Rebennack, has been a storied figure on the New Orleans music scene for decades. However, his solo performances are few and far between. His last several gigs in the New Orleans area have featured a new band and a new sound. While an acoustic piano has been part of his stage rig for years, his recent performances and recordings have focused on the organ. Other musicians on the bill include Kermit Ruffins & the BBQ Swingers, John “Papa” Gros, Linda Wright Gospel Band, John Lisi & Delta Funk, Joe Krown Trio with Brint Anderson, and Mike Barras and The Tin Men. A silent auction will be held with many amazing items including concert tickets, spa services, gift certificates, and a lot more! Tickets are $25 and on sale at the House of Blues Box Office or via Ticketmaster.